It’s fair to say that I don’t blog as often as I’d like to. There’s lots of reasons for this, and one of the lamest is not taking enough of the ‘right type’ of photos to put in my posts. I take lots of photos – like many mums probably too many – but just not enough of the ones that feel good enough and nice enough to sit on the top of a blog post. It can be easy to get trapped behind the camera, forgetting to enjoy the moment because you’re too busy trying to capture it. And sometimes you’re just too busy watching the scene unfold before you to think to grab the camera and capture it. A couple of months ago now we were up in Aberdeenshire for a few days for a friend’s wedding, and spent a slightly hungover post-wedding morning exploring the fabulous Duthie Park in Aberdeen. The wedding itself had taken place in the Winter Gardens there so we thought it would be nice to have a proper look around and check out the playgrounds while we were there. The girls got stuck straight in with Daddy whilst I nipped back to the car to pick up something I’d forgotten. Crossing back over the car park, Tunnocks Caramel Wafer halfway into my mouth (a freebie from the hotel room – I’m all class), my stomach gave a lurch that wasn’t hangover induced. A small figure was sliding towards me at a rapidly increasing speed, straight down the (not even exaggerating) 30 foot long slide on the hillside. Hey, it could even be 40 foot – I wasn’t measuring it and for once Google doesn’t seem to know, so in the absence of evidence to the contrary I think we can all agree that it was at least 50 foot long. Ok so now I’m exaggerating, but you get the idea. 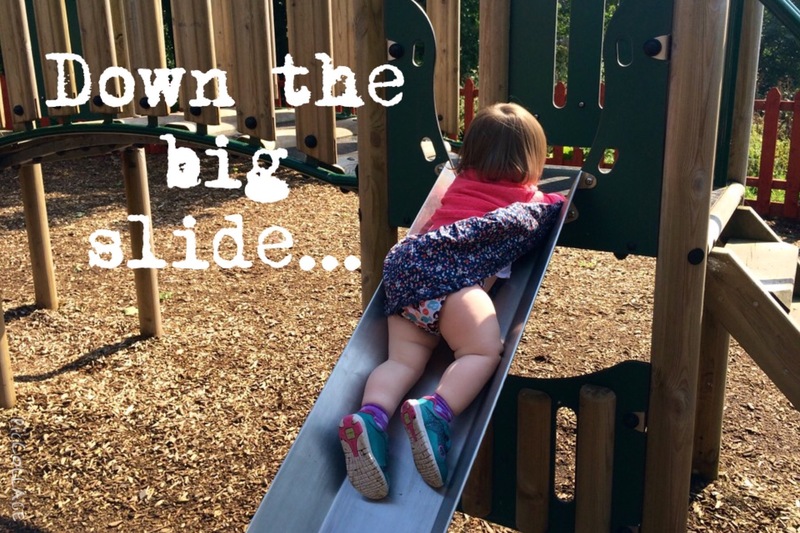 It was a big slide, far too big for a one year old to be conquering on her own. With visions of a crumpled, battered toddler screaming at the bottom of the slide I lurched towards it to rescue her. Only she was none of the above. I’d go as far to say she was quite pleased with herself, albeit a little surprised by the extent of the ride. Daddy insists that he was trying to get onto the slide with her on his lap, the sensible father way. And knowing how she can contort herself to get out of your grasp when she has her mind on something I can believe it. Suffice to say we’re staying away from excessively tall slides for a while, and there was no photographic evidence of the event. Instead the picture shows her reprising her stunt on a far more appropriately sized slide a few days later. The incident clearly hasn’t put her off slides just yet.